Snow-peaked mountains, sprawling streams, placid lakes, emerald green meadows, fringed by pine trees, misty weather are the images that lingers on when I try to put my journey experience in black and white. Though, I am trying my best to relive each and every moment of my exhilarating journey through my blog, however, the beauty of the places –Assam, Arunachal Pradesh, Meghalaya – leaves me speechless. I am dumbfounded to express the beauty of the place, which has been captured through my eyes and entrenched in my soul for ever. 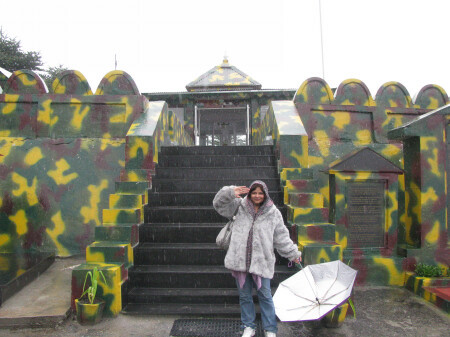 The first day of my visit was in Assam, where I did little bit of sightseeing as I had just half a day in hand. 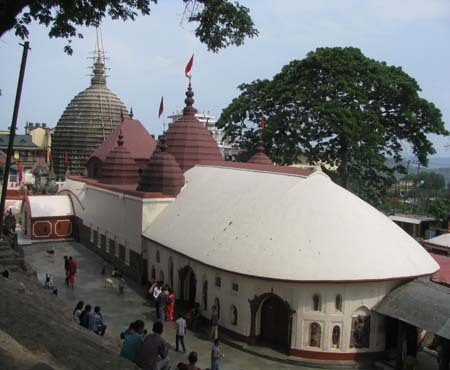 I visited one of the revered Shakti Peeths, the famous “Kamakhya Temple”. Being a Durga devotee myself, I found this temple very different from the other temples. It was almost evening when I started for my onward journey to Tejpur, which was a transit point for my enchanting and eye-opening journey to Arunachal Pradesh. I reached Tejpur in the night and checked in at the hotel. The sleepy town is a classic small town with couple of decent hotels. On reaching my hotel, I crashed on the bed as I had to start early the next morning. After early breakfast, I started for my onward journey to Dirang, which is famous for its apples and Kiwi cultivation. Enroute visited Nameri National Park, which is known for a wide variety of flora and fauna. 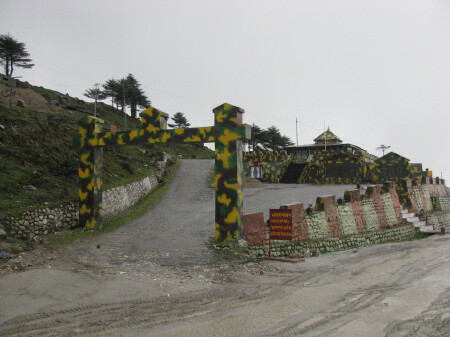 Crossed Bhalukpong, which is around 56 kms from Tezpur and is the entry point in Arunachal Pradesh. 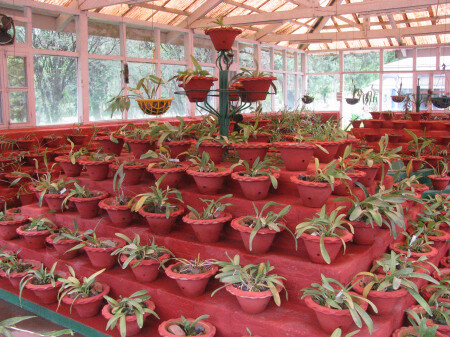 Around 5 km from Bhalukpong, is the Asia’s third largest Orchidarium at Tipi, which is famous for its wide variety of rare orchids. 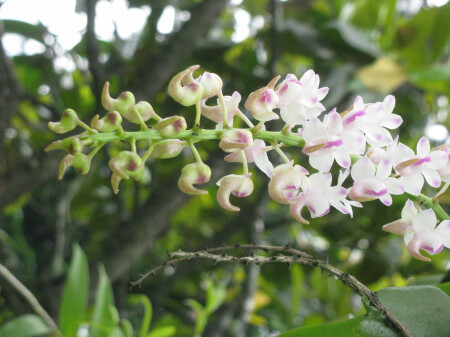 Around 450 species of orchids are found. 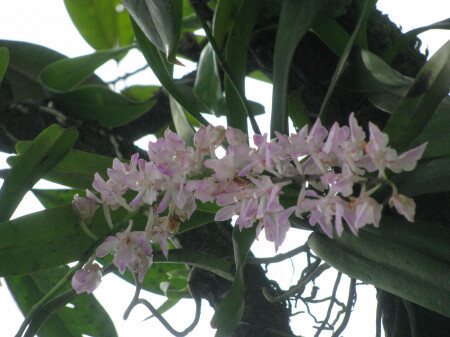 Glass house and an orchid museum are worth a watch. The drive from Tipi to Dirang was totally mesmerising as the lush green mountains and the meandering river ‘Kameng’ played hide and seek all throughout the route. Ascending and descending through various mountain ranges was a lifetime experience and a feast for the eyes with gushing streams at almost every nook and corner . With every climb, the weather got cooler and pleasant , which made my journey an enjoyable experience especially after the sultry weather in plains. The lush greenery coupled with heights gained at every bend offered a heady mix of thrill and adventure. I stopped for lunch at a small village named ‘Nechiphu’. 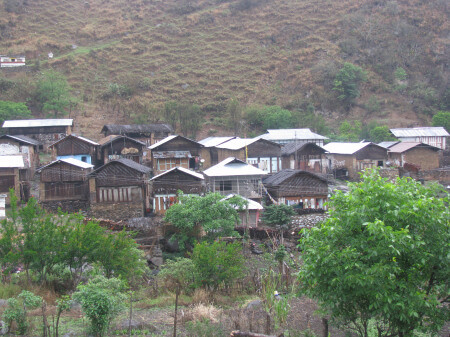 The road-side shops offered simple fare like a lunch plate comprising of dal, sabzi, rice and chapatti or momos and Thukpa, a regular with the locals. Also bought couple of water bottles as the stretches are long with very few shops. After lunch, the journey was smooth. I crossed Bomdilla, which is around 109 km from Bhalukpong and is a five hours drive, however, didn’t stop since I had a night halt at Bomdilla during my return journey. Ultimately reached ‘Dirang’ at around 5 pm. The breathtaking view of the town and the valley was totally out of the world. 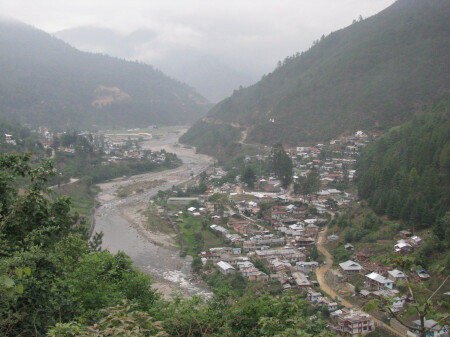 Our night halt was in Dirang, a beautiful town in Arunachal Pradesh. 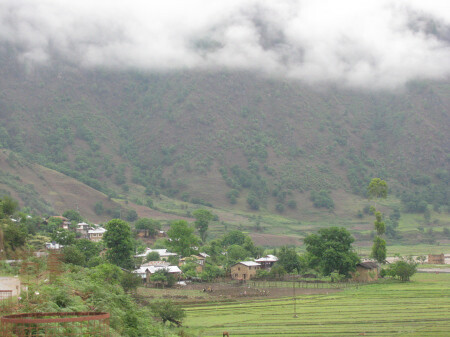 I was put up in one of the best hotel, which offered a splendid view of the Dirang valley. After the tiring journey, I was totally famished and needed a brimming cup of hot tea. 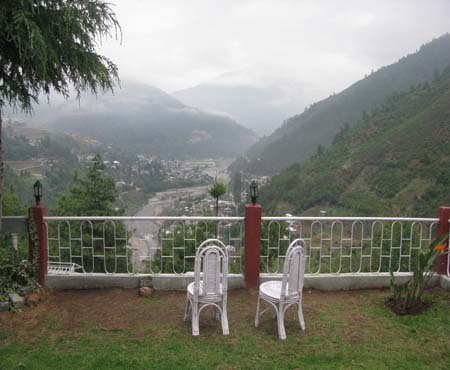 The experience of sipping tea in the lawn of the hotel overlooking the valley was a totally blissful experience. I have never relished my tea so much, being amidst nature, a sense of serenity and calmness pervaded me, I felt one with nature. After tea, went and explored the local market, which was buzzing with activity. The market was located at a distance, so asked my driver to drop me at the market. Had early dinner and crashed on the bed as the next was supposed to be even more hectic. The next day, I had an early breakfast and started off since a lot had to be covered. 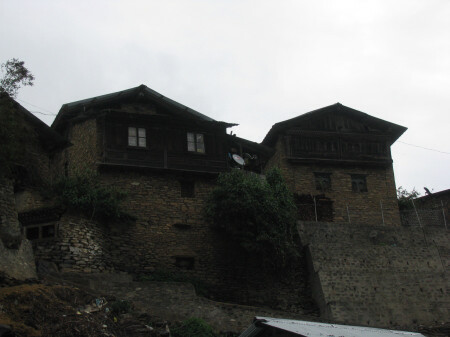 We started off with the local sightseeing of Dirang – first visited Apple and Kiwi orchards followed by a village tour of Dirang Dzong (Dirang Basti) to get a real feel of the local experience. The village tour was one of the most interesting part of the tour as it offered me a complete insight of the local culture. Though the locals are very shy people. I captured them in my lens. I would personally recommend a village tour to every travel enthusiast. There was much in store for me in my next halt at Sangti Valley, which is around 9 kms from Dirang town. The valley is famous for the Siberian black neck storks, who visit during winter. 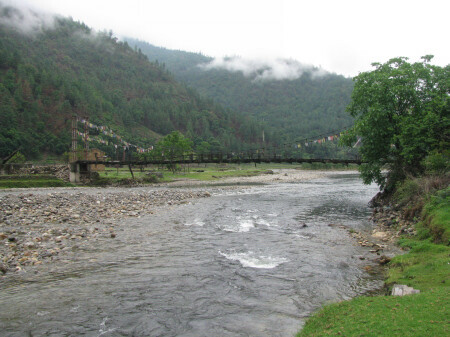 The journey from dirang town to the valley is itself spectacular as the river Dirang Chu winds its way through the hills. The first sight of the valley excited me so much that I was ready with my camera to capture the scenic landscape and the panoramic view. After Sangti Valley, I left Dirang behind and proceeded for my next halt to Tawang, which is around 143 kms from Dirang. Enroute to Dirang, also visited hot water spring. This part of the journey was the most spectacular as it offered abundant natural beauty, however, there were short stretches of bad roads too. The scenic landscape , winding river, the majestic eastern Himalayan range compels one to revel on nature in its full splendour. One tends to forget all worries & insecurities with every climb and just gets engrossed with the nature in all its bounty. Stopped for lunch in a small village. I had maggi, and trust me, it never tasted so good, especially the soupy style. 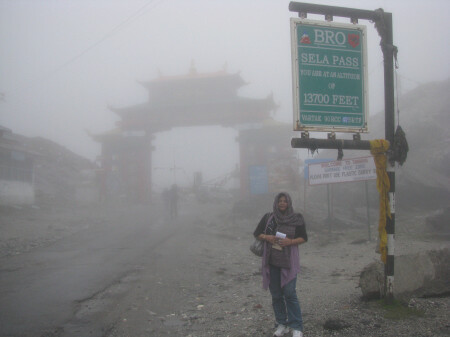 After a quick lunch, I proceeded immediately as I was warned to cross Sela Pass before noon owing to visibility factor. 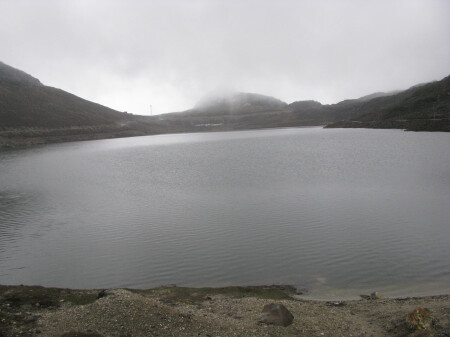 On the way to Tawang, Sela Pass is the second highest motorable pass at 14000 ft height, which runs through a small ridge along the Paradise Lake. I comfortably passed Sela Pass before noon, felt great, as I posed for the camera at 14000 ft above the sea level. Never in my dreams did I ever thought that I would achieve such unattainable height, speaking literally. Since, I belong to a defence personnel family, I remembered my dad, who use to tell us about the hard life in mountains. As I proceeded to my next halt “Jaswant Gar’, a war memorial raised to pay homage to Jaswant Singh (Mahavir Chakra Awardee – Posthumous), who singlehandedly stopped the Chinese battalion during the 1962 Indo-Chinese war, my patriotic emotions found a natural expression and came to the fore. I couldn’t help myself saluting my dad (whom I missed a lot) and to the entire Indian Army, who are giving their today to ensure better tomorrow for us. This is for all defence personnel – “Jain Hind” & hats off to you. Had a steaming cup of hot tea from the nearby canteen run by the Indian Army and proceeded further as we had to cover quite a distance. The bunkers on the top of the memorial reminded me of the difficult life my father , as part of the Indian Army, spent at such heights. My eyes filled with emotions kept searching for the route through which the Chinese entered India during the 1962 war, suddenly fell on the point from where the first view of Tawang could be seen. Nestled in the lap of the Himalayas at 3500 metres above the sea level, this beautiful land of Monapas from a distance seemed like city spread over a number of hills with its Monastery immediately capturing one’s glance. 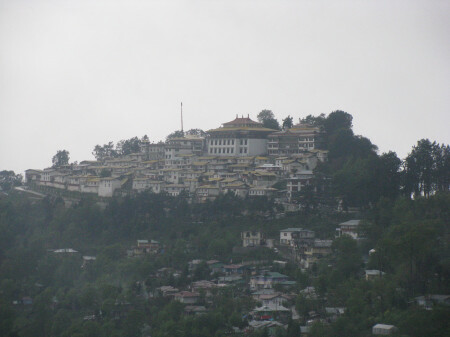 The legendary 17th century Tawang Monastery, perched atop a hill, overlooking the hill and surrounded by thick clouds, entices the spiritual part of even the atheists with its ethereal peace. I kept looking at the monastery in awe when a sharp shower forced me to rush back to the vehicle. It started raining heavily and the descending mist and cloud, all of a sudden reduced the visibility to just a few metres. We cautiously started descending. The valley in front of me and the monastery yonder suddenly got engulfed by the clouds. Our driver stopped at a point and pointed to the Jung Falls at a distance, which had swelled up due to heavy rains. The water gushed from the falls making it a spectacular wonder and reminded me of the scene from the Bollywood blockbuster ‘Koyla’ starring Madhuri Dixit and Sharukh Khan. 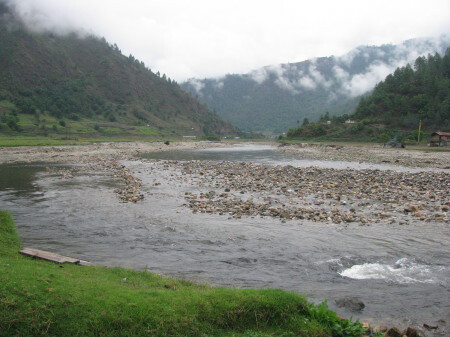 It would not be out of place to mention here that some part of the movie “Koyla’ was shot in the vicinity of the ‘Jung’ (Nuranoor) falls as well as the Madhuri Lake ( ) in Arunachal Pradesh. As the weather was getting worse, we decided to visit the falls on our way back as we had to return through the same route. 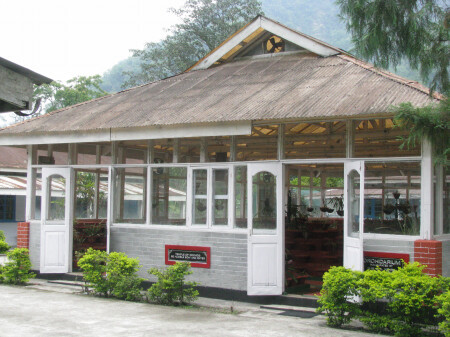 After crossing a number of small villages, we finally reached Tawang. It had stopped raining and the sight of monks rotating the prayer wheels in the middle of the city reminded us that we were in the land of Lamas. 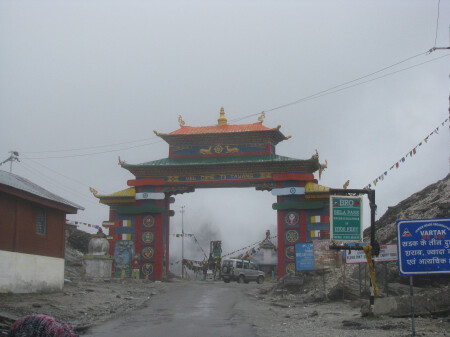 We had proceeded a little when the main gate with the caption “Welcome to Tawang” greeted us . We crossed the market and proceeded towards our hotel. On the way, and interesting piece of architecture captured my attention. It was a big prayer wheel on a traffic island in the middle of the road rotating constantly on the logic of water turbines i.e through the flow of water . As the wheel rotated, a bell on top rang at regular intervals spreading positive energy all around the city adding to the religious fervour . We checked in at our hotel and decided to take it easy since we had couple of days in hand to explore the place. We had a leisurely dinner and crashed on the bed as the next day held more adventures.